If you’re planning a vacation for your small family, for you, your special someone and another couple, or for you and your closest travel buddies, Villa Bulan is the ideal place for you to stay. Its compact layout makes full use of the available space – provided only with the most essential yet convenient, comfortable, even stylish, amenities and furnishings. 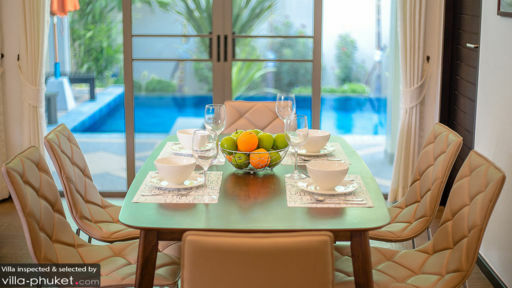 You will truly enjoy moments of bonding and intimacy amidst Villa Bulan’s cozy and exclusive ambience. 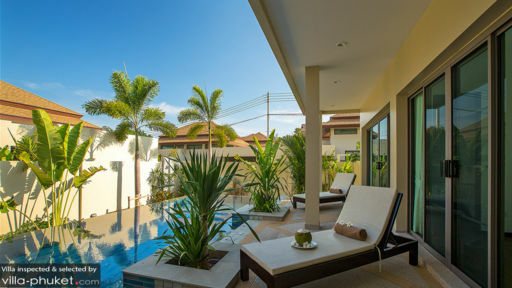 The villa has two bedrooms which open out to the covered terrace and to the swimming pool. Both bedrooms also have king-sized beds and dedicated bathrooms. The entire outdoor area is devoted to the eight-meter swimming pool. Give in to its beckoning, crystal-clear waters. 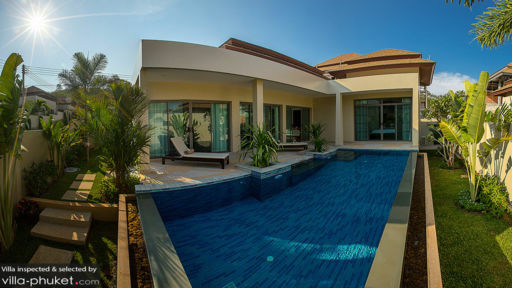 You can easily jump in anytime – anywhere you may be in the villa. From the swimming pool, you can lie under the shade on one of the cushioned pool beds arranged around the covered terrace. Occupying most of the indoor space is the living area. Here, you can all get together on the large and long couch facing a widescreen TV to catch your favorite show. Just behind the couch is the dining area. On its wooden table which can accommodate up to six, you can all get a taste of one another’s culinary creations – which you all took turns concocting at the kitchen corner next to the dining area. In charge of the villa’s maintenance is a housekeeper and a pool attendant. Also on duty is a security detail. Just a few minutes’ drive from Villa Bulan is Nai Harn – a white-sand beach where you can absolutely have your fill of the ocean. That’s because aside from swimming, you can, right here, also get onboard a traditional Long Tail Boat and go on an island-hopping exploration of nearby Ko Bon, Ko Kaew, Ko Lon, Ko Aeo and Ko Hae – which is also known as Coral Island. Back at Nai Harn, don’t miss out on fresh and delicious seafood. The must-try place is Sala Loi where you can also get to experience the traditional way of dining – from a mat on the floor. By the afternoon, head off to the Phuket Shell Museum and Promthep Cape View Point to marvel at the magnificent sunset.